"...this time in Vancouver, BC, on August 24 at Rogers Arena. And there is a TWIST – you'll be a part of the show!! 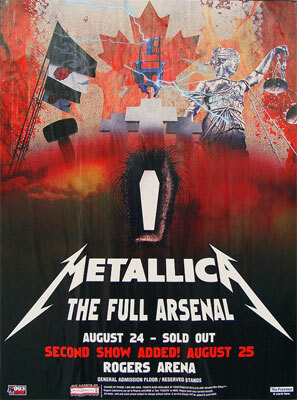 That's right, we will be filming this show all in 3D for... you guessed it, the upcoming Metallica 3D movie that we've mentioned on and off a few times this year. We couldn't think of a better place than Vancouver to end our three week new stage run with cameras capturing it all, so bring your nuttiest, craziest Metalli-self to the show, be a part of movie history, and show the rest of the world how much Vancouver rocks." 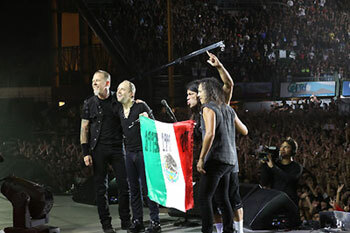 The band will also be on Edmonton for 2 shows with a total of 4 shows following a sold out run in Mexico City. "...we are proud to announce that we have been invited to headline the Outside Lands festival here in our hometown of San Francisco the weekend of August 10-12 in beautiful Golden Gate Park. 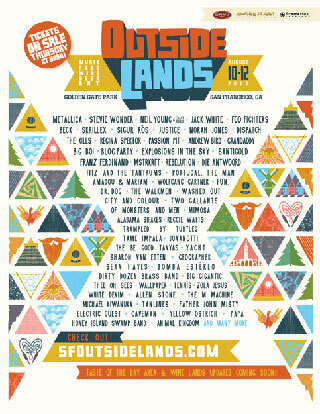 This will be the fifth annual Outside Lands, so we are honored to finally get to play in the park! The line-up this year is stellar and we're super excited to sharing the same stage as the Foo Fighters, Jack White, Beck, Neil Young and Crazy Horse, Stevie Wonder, The Kills, Justice, and Skrillex, just to name a few of the artists who will appear during the three day festival."